Targets the sources of redness, restores and strengthens the skin’s protective barrier and helps calm skin prone to sensitivity, such as rosacea-prone skin. This lightly cooling serum is formulated with NeoStrata BioCalm Complex™, a proprietary blend of ingredients to target the sources of redness, restore and strengthen the skin’s protective barrier and help calm skin prone to sensitivity, such as rosacea-prone skin. NeoStrata BioCalm Complex™ features bio-active benefit ingredients to help interrupt the inflammation cascade, improve skin resiliency and reduce the appearance of flushing, while decreasing the potential for future redness-inducing triggers. A patented Bionic/PHA formula helps restore and strengthen skin’s protective barrier, while calming irritated skin and reducing redness. Vitamin E and White Tea Extract, potent antioxidants, help defuse UV induced damage caused by oxidative stress. 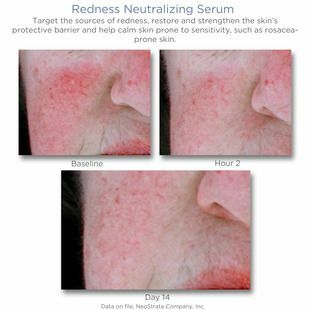 As a result, skin is calm and redness is neutralized. Aqua (Water), Butylene Glycol, Gluconolactone, Isocetyl Stearate, Hydrogenated Polydecene, Arginine, Glyceryl Stearate, Cetearyl Alcohol, PEG-100 Stearate, Lactobionic Acid, Dimethicone, Magnesium Aluminum Silicate, Aesculus Hippocastanum (Horse Chestnut) Seed Extract, Ascophyllum Nodosum Extract, Tocopheryl (Vitamin E) Acetate, Palmitoyl Tripeptide-8, Asparagopsis Armata Extract, Camellia Sinensis Leaf Extract, Epilobium Angustifolium Flower/Leaf/Stem Extract, Ammonium Glycyrrhizate, Caffeine, Bisabolol, Zinc Gluconate, Sorbitol, Mannitol, Ammonium Hydroxide, Propylene Glycol, Dextran, Disodium EDTA, Xanthan Gum, Caprylyl Glycol, Isopropyl Titanium Triisostearate, Phenoxyethanol, Chlorphenesin, CI 77288 (Chromium Oxide Greens).